When decorating a room, it's easy to get lured in to buying things that are trendy. You know - the "it" item you saw at Target that all the cool kids have dotted throughout their instagram feeds. Before you design your entire living room around that groovy macrame' dream catcher, ask yourself if you realllly love it, and if you think you'll really love it 10 years from now. Decorating your home is an investment, and it's wise to choose the majority of your design elements that are of good quality and will stand the test of time. Here are my recommendations for decor pieces you'll never regret buying. Ever. 1. Vintage Persian or Oushak rugs. In the room above by Miles Redd, the antique rug provides a starting point for the color palette in a room that is at once timeless and current. That is the goal! And a gorgeous rug can go with you from home to home down the road. 2. Art that Speaks to You. You should have an emotional connection to the art that hangs on your walls. Don't buy a painting you're ambivalent about just because it has the same shade of blue found in your curtains. Buy art that inspires and moves you. Select pieces with straight, clean lines and minimal ornamentation for maximum versatility. You'll never regret investing in a beautiful light fixture. Whether it's antique or cutting edge modern, the power of a fabulous light fixture cannot be underestimated. Great lighting doesn't always have to break the bank, as seen in this charming breakfast nook by Atlanta's Allison Allen. The oversize paper lantern makes a big statement! This is another chameleon that works well in traditional or modern settings. And an ornate mirror will work with any color palette! 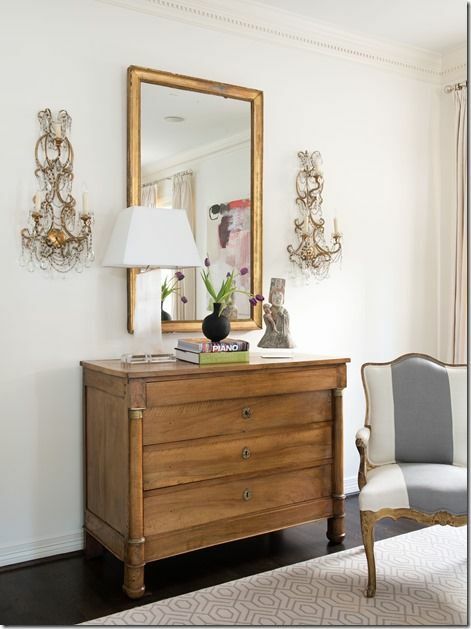 Statement fixture, unique art, an ornate mirror, and antiques coexist beautifully in a room by Sara Ruffin Costello with a decidedly modern approach. This room is completely timeless and will be forever chic. I hope this post gives you the confidence you need to invest in pieces that will grow with you and provide decades of enjoyment in your home!